Primitive Country Cottage Chic Wild Flower Hanging Hand Painted Vintage Book. Sweet and simple are these dainty cream colored wild flowers in the meadow. Great spring time accent or for a shabby chic cottage theme. My very popular, original wild flower design is also customizable. Choose your favorite saying, your books border frame color and also a new option is to be able to change the color of the flowers. 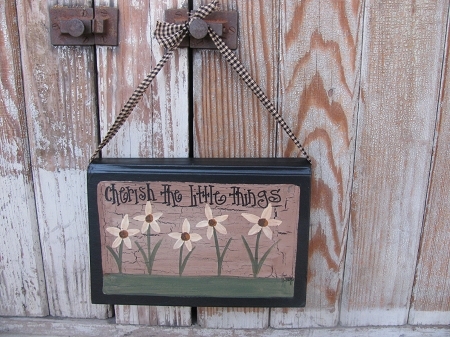 Option shown has black frame border, Cherish the Little Things as the saying and cream colored flowers. Hand painted on a vintage hard covered book, so each one is unique. Sizes vary slightly, most are around 5"x7". Hangs with coordinating homespun fabric. Hand painted, designed and signed by Heidi.